MANXMAN Conor Cummins will be joining 20-times TT winner John McGuinness in 2014 as the confirmed Honda Motor Europe riders for the infamous Isle of Man TT and North West 200. 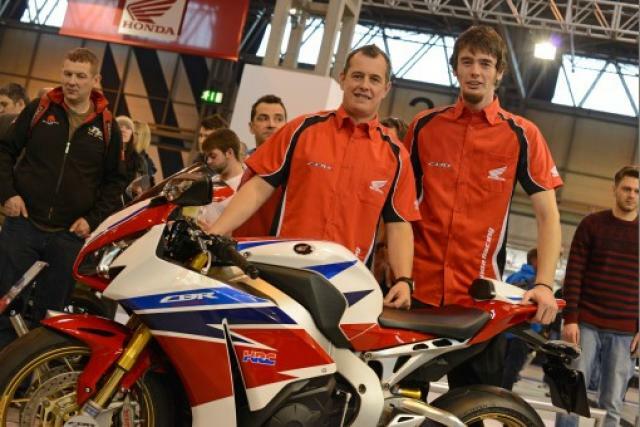 Cummins is the third fastest rider in history around the Isle of Man TT course and will make his debut onboard the 2014 Honda CBR1000RR Fireblade in the Superbike and Senior race as well as the Superstock class. After a career-threatening crash during the second lap of the 2010 Senior TT, the 27-year-old hopes to gain good results for the Honda team after aiming for a ride like this since the beginning of his career. Cummins said: “I am thrilled to bits to be with Honda in 2014. In my eyes this is the absolute pinnacle of road racing. Riding for a team like Honda has been something I’ve been aiming for my whole career so for me this is a huge deal. It’s also been confirmed that 41-year-old McGuinness, who already has 41 TT podiums and 20 TT wins, will continue with Honda next season. McGuinness said: “I’m really glad to be staying with Honda to continue the strong relationship we’ve built up in road racing over the years. The team is like family to me and it’s important that I have support that I know I can rely on 100%. Team Manager Neil Tuxworth commented on the new addition to the team: “We’re pleased to announce our 2014 line-up for the roads and very happy to welcome Conor Cummins to the team. He’s an Isle of Man lad whose father and uncle have raced on the island so the TT is in his blood.